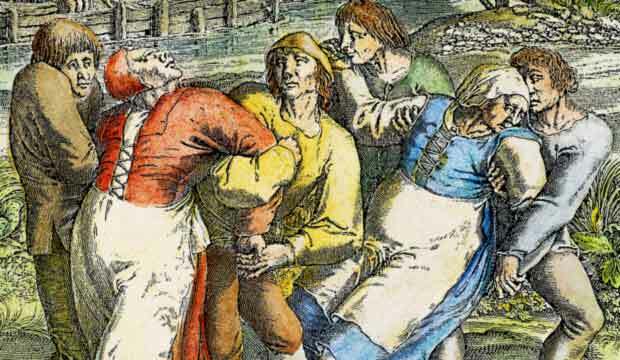 For centuries epilepsy was thought to have supernatural, usually evil, origins. To drive out the dark spirits that made them shudder with seizures, epileptics were subjected to exorcisms (even Jesus cast out an unclean spirit from a probable epileptic), prodded with hot pokers (to release “pernicious humours”) and plied with poisons (arsenic). By Victorian times, masturbation—an evil practice by the day’s standards—was considered a principal cause of the disorder. This notion, more the product of straitlaced values than of scientific inquiry, prompted the discovery of the first effective anticonvulsant. In 1857 Sir Charles Locock, Queen Victoria’s obstetrician, read that potassium bromide calmed sexual appetites. After he tested the drug on several female patients prone to seizures prompted by “sexual excitement” (or so he thought), the seizures ceased. Locock revealed his discovery at a Royal Medical and Chirurgical Society meeting, and by the 1870s bromide was widely prescribed. It remained the only effective anticonvulsant for more than 50 years. While certainly an improvement on earlier treatments, bromide produced serious side effects, including boils, lethargy and dulled mental function (hence the origin of bromide’s meaning as a dullard or a platitude). In 1912 bromide was superseded by phenobarbital, a central nervous system depressant that proved highly potent with fewer side effects. The drug is still widely prescribed in the developing world, but in the West dozens of medications have replaced it. “There are lots of choices,” says Carl Bazil, director of clinical anticonvulsant drug trials at the Columbia Comprehensive Epilepsy Center in New York City. “Though they’ve minimized side effects, none have been proven more effective than drugs that came before.” Even now, 30% to 40% of patients have seizures that cannot be controlled with treatment. For those patients, high-tech options are also in the pipeline. One such device, a responsive neurostimulator, is in clinical trials. Embedded in one’s skull, the device emits shocks to stop seizures. Researchers’ ultimate goal—to find a cure—is a complicated endeavor, not least because epilepsy may not be just one disorder. Its symptoms are different from one patient to the next; its causes are myriad (from head injuries to infections); and for about two-thirds of epileptics, the cause is unknown. Much about epilepsy remains a mystery. And that’s no bromide.